Carefully selected holiday cottages in Scotland. Search for late availability accommodation by using the search box or by location using the interactive map. Typically 20-30 % discount can be found for last minute cottage reservations. 3 Bedrooms. Sleeps 6. Pets. 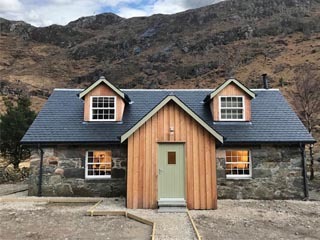 This newly refurbished cottage is very remote and situated at the head of Loch Hourn. The setting is magical - you can relax and unwind whilst enjoying some of Scotland's most stunning scenery or walk, kayak, spot bird and wildlife and star gaze. 13 Bedrooms. Sleeps 31. Pets. Scotstoun Farmhouse, West Linton . 4 Bedrooms. Sleeps 6. Pets. 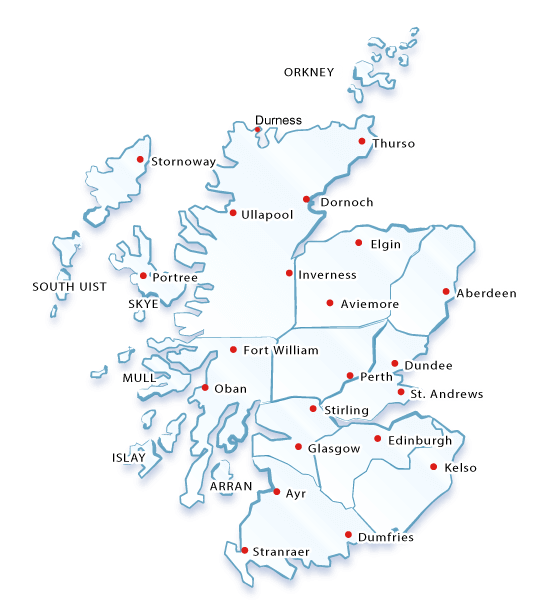 The far north of Scotland and the romantic Scottish highlands are perfect for a holiday in Scotland. There are many remote Scottish cottages here - isolated holiday cottages in Sutherland and Caithness usually have log fires and amazing sea views. If you want to hire a holiday cottage near Loch Ness or rent self-catering in Plockton there are lots of stunning properties. Hillwalkers and climbers holidaying in Scotland love to stay in highland cottages near Munros. Many cottages with hot tubs are in the Highlands. Staying in a self-catering cottage in Perthshire gives you the chance to explore towns such as Aberfeldy, Pitlochry or Dunkeld. You can escape to a Scottish country cottage for a romantic weekend break or rent a cottage in Scotland for your honeymoon. Holiday cottages in Perthshire are a perfect base if you want to ski at Glenshee, walk in Glen Lyon, or climb the many munroes in Perthshire. The Strathearn valley is home to Gleneagles, where golfers can pay a green fee - easy breaks for Scottish self-catering golfers holidays. Holiday houses in Aberdeenshire range from isolated Scottish farmhouses to large holiday cottages in beautiful countryside. Luxury cottages near Balmoral or Braemar are popular tourist locations from which to explore Royal Deeside. Many of the cottages are near National Trust houses, and stately homes such as Fyvie Castle. Large houses to rent accommodating up to 20 people are ideal for private parties and large family holidays; property owners can often recommend a cook if you prefer not to self cater. The East Neuk of Fife is very popular for a vacation if you want to play golf at St Andrews or explore the wonderful Fife coast. The large open beaches and sand dunes are perfect for family seaside holidays. Coastal holiday accommodation includes fisherman's cottages overlooking a harbour or luxury seaside cottages in Fife. Staying in a holiday house in Angus gives you easy access to Glamis Castle. Many cottages and holiday homes are pet friendly, welcome dogs, and have special offers for late availability and discounted weekend breaks. It is hard to beat the romantic west coast of Scotland for a holiday and there is lots of group accommodation here. Rent a holiday cottage on an unspoilt beach, backed by mountains, whether in the haunting beauty of Glencoe or near the holiday towns of Oban and Fort William. Sailing holidays in Scotland often centre on a seaside holiday cottage in Ardfern or on the Ardnamurchan or Kintyre peninsulas. Fishing, hill walking, mountaineering are popular vacation pursuits in Argyll amongst the lochs, glens and stunning coastline. 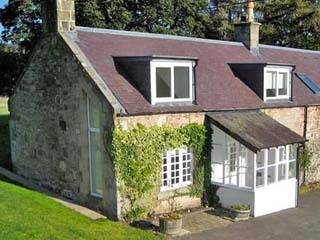 Holiday cottages in Dumfries and Galloway are often white-washed small cottages by the sea. This isolated part of Scotland has many luxury cottages to rent for a holiday in the Galloway countryside or on the Solway coast. If you want to spend your holiday in Dumfries and Galloway riding then there is plenty of selfcatering rental accommodation suitable and several excellent stables. Ayrshire and Lanarkshire also have their charms and quality holiday houses for a comfortable stay. The Scottish Borders are a great place for a Scottish fishing holiday with the Tweed and Teviot flowing through. Renting a town house in Kelso, Jedburgh, Selkirk or Melrose mean you can explore the magnificent ruined Border abbeys and Scottish country houses. Holiday accommodation in the Borders includes staying in historic castles and keeps as well as farmhouses in beautiful rolling countryside.f you are on a cycling holiday in Scotland then don't miss the 7Stanes site at Glentress and Innerleithen - there are lots of other on and off road cycle trails in the Borders too. 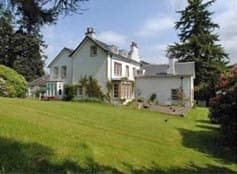 Vacation accommodation in this area includes luxury apartments in Stirlingshire, isolated holiday retreats in the Trossachs, and large houses with lovely gardens for idyllic weekend breaks near Loch Lomond - the central region of Scotland has it all. Last minute breaks are possible in most of the cottages. Glasgow self-catering accommodation is also available - why not look for late availability in Scotland's most vibrant city. Rent apartments or town houses in Stirlingshire for a romantic city break, with easy access to the Scottish countryside. Whether you want to rent a self-catering flat in Edinburgh, or a cottage in West, Mid or East Lothian, you will find your perfect holiday house here. Edinburgh, the capital of Scotland, has stunning Georgian New Town flats to rent in the centre of this elegant city. The farming counties to the south offer easy access to the city as well as luxury holiday cottages in the Scottish countryside. If you want to rent accommodation for the Edinburgh Festival then don't leave it to last minute booking: Edinburgh is full of tourists for the festival! Speyside holiday cottages and self-catering in the north east of Scotland vary from hideaways near the Whisky Trail to seaside cottages on the Moray Firth. Wildlife spotting is popular if staying in Speyside self-catering as it's home to ospreys, dolphins, red squirrels, deer to name a few. Skiing in the Cairngorms is fabulous and at Aviemore there are cottages to rent near the ski slopes which you can book last minute as soon as the snow arrives and the ski gates open. Findhorn holiday houses and Nairn self-catering homes are great places to stay in and explore Speyside. Visit the Isle of Skye for coastal holidays on a Scottish island - you can rent island holiday cottages near Portree or traditional crofts by the sea. Hebridean holiday cottages offer a chance to getaway from it all to a different world. All Scottish island cottages are wonderful - self-catering on Mull, Skye, Uist, Lewis and Arran offer special places to stay including traditional thatched crofts. Holiday homes on the Orkney Isles are in spectacular island locations with amazing archealogical sites to explore. The north coast 500 - over 500 miles of stunning coastal scenery in the far north of Scotland, is named one of the top coastal road trips in the world. 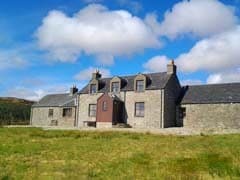 An excellent selection of self catering large holiday homes, lodges, cosy cottages, and castles for holiday rentals in Scotland, UK. Pet friendly cottages, accommodation at Christmas and Hogmanay, child friendly places to stay as well as romantic highland hideaways, and properties with disabled access may be rented. scotland-holiday-cottage.com caters for cottages for couples and families - 2, 4, 6, 8 bedroom and large 10+ bedroom holiday properties. Scotland is a top UK vacation destination offering holiday activities year round.